MyGeoHub is a HUBzero based platform integrated with advanced geospatial data and computation services. It provides the underlying infrastructure for a number of research and education projects across multiple disciplines. All published content from the hosted projects, including papers, presentations, videos and other material, can be accessed publicly. You will need to sign up for a free account in order to run any tools or access courses, groups, projects, wikis, forums, and the ticketing system. Your account on MyGeoHub.org will enable you to access various shared resources, including image processing and visualization tools and high performance computing systems. This step requires all users to have an account on mygeohub.org or an account at a research and higher education institution which is part of the InCommon Federation. 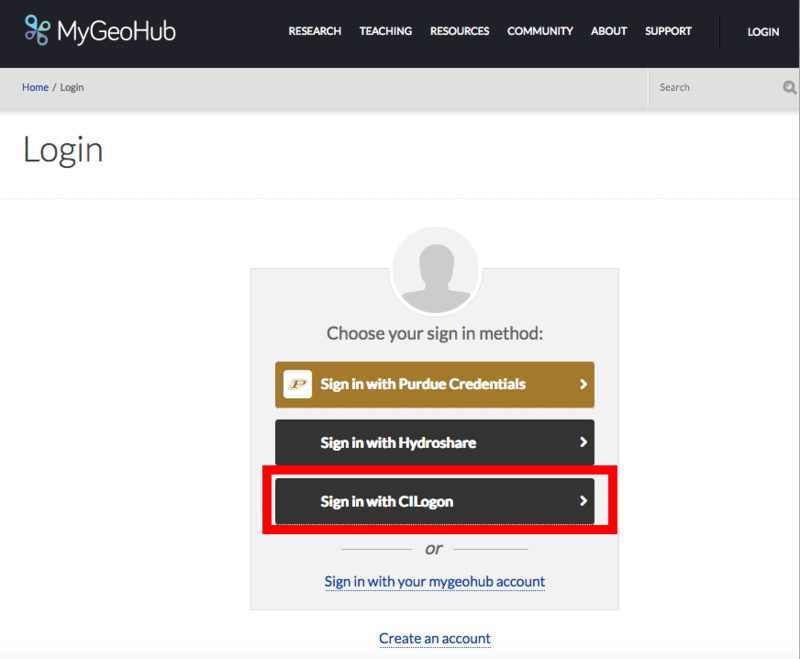 Case I: If you have an account on mygeohub.org, you can go to the login page, select Sign in with your mygeohub account, and login using your MyGeoHub account. Then go to the next step. 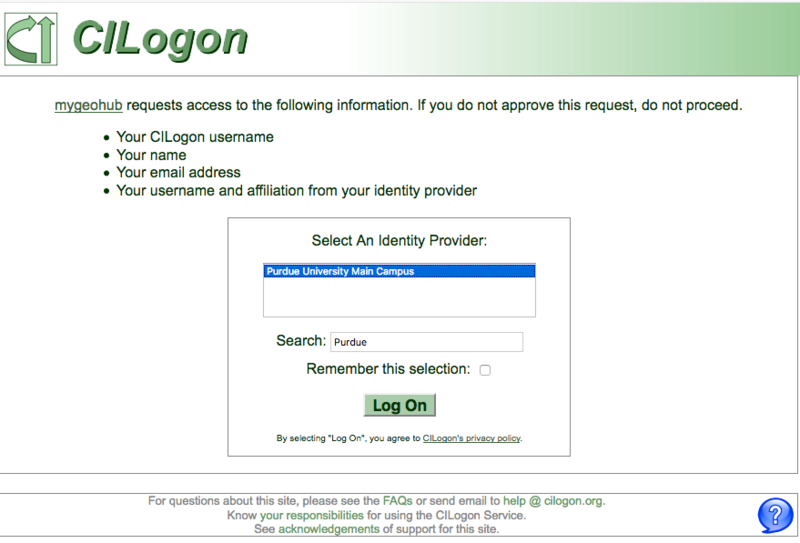 Case II: If you do not have an account on mygeohub.org but have an OpenID account (such as Google account) or an account at a research and higher education institution which is part of the InCommon Federation (such as Purdue University), go to the MyGeoHub login page and select "Sign in with CILogon". In the CILogon interface, search and/or select your institution to login as shown below. 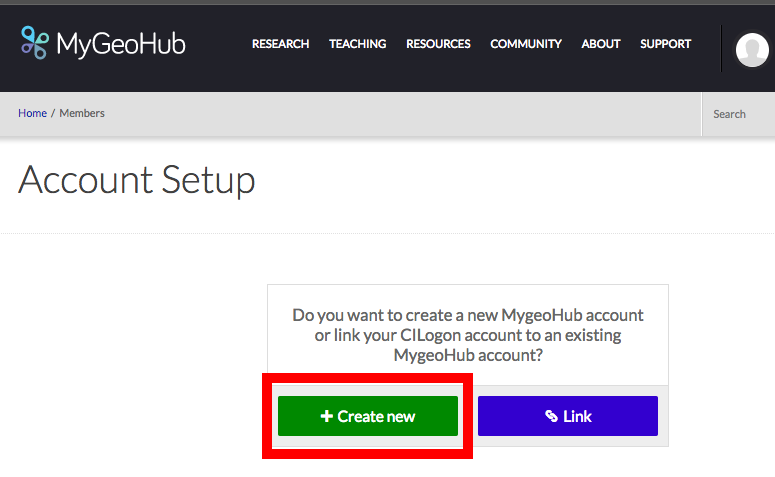 After you select your institution and login using your institution's account, you will be asked to create a new MyGeoHub local account or link your CILogon account to an existing MyGeoHub account. Click on "Create New" button, and follow the steps to create a new local account. After you fill out all the required information, you will get an email to activate your local mygeohub account. This is a one-step procedure, which you will not repeat in the future when logging in using your institution account via CILogon. Case III: If neither Case I nor Case II works for you, please use this link to create an account. After you fill out all the required information, you will get an email to activate your mygeohub account. 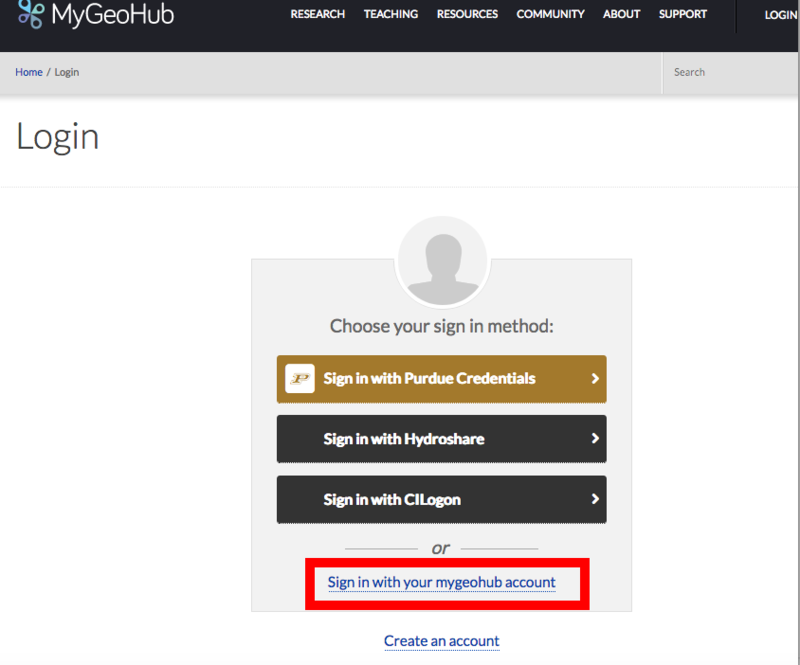 After that, go to the login page, select Sign in with your mygeohub account, and login using your new MyGeoHub account.